The latest version of the Omni Group not only updates for iOS 11 compatibility, but also takes advantages of changes to Siri and the addition of drag and drop. 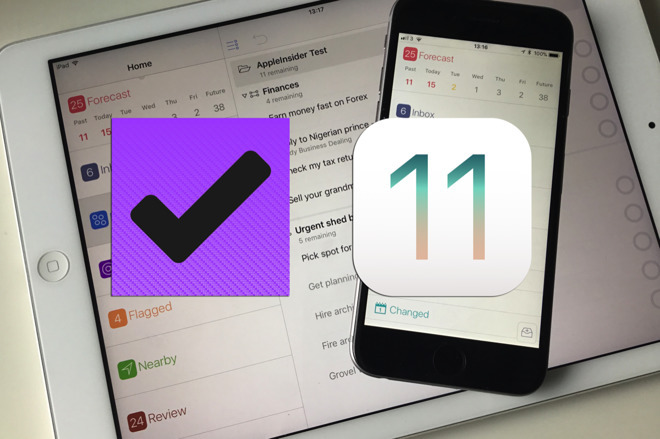 The OmniFocus 2.21 To Do app for iPad and iPhone has been updated to make excellent use of new features in iOS 11. You can now add To Do tasks directly through Siri and by dragging and dropping from other apps. Once you've got a task in OmniFocus, that same dragging and dropping is also used superbly well for manipulating and organizing your work. All that said, though, these are iOS 11 features that need learning. You have to be shown them and you have to practice them. There is no possibility whatsoever that you could just stumble across them by chance or even really by exploration. What the Omni Group company has done is seen how useful these features could be and worked to wring every possibility out of them. In some cases that means OmniFocus is pushing at the limits of what iOS 11 does and in one case it has to work around an issue. The workaround is a small thing in how you can now dictate your tasks to Siri but you have to phrase your request in an unfamiliar way. You've long been able to capture tasks by Siri though a different workaround, though, and that one still works. As before, you can ask Siri to remind you of something and iOS will pop the task into Apple's Reminders - where OmniFocus snatches it out again. Behind the scenes that was a bit of a fudge but once you'd set it up then as far as you were concerned, you were just dictating tasks into OmniFocus directly. However, there was a big limitation. OmniFocus lets you arrange your many tasks into different projects or folders full of projects but it also has a general inbox. That's for quickly lobbing in a To Do that you'll sort into a project later. The old Siri/Reminders workaround could solely drop your newly dictated tasks into that inbox. Consequently it was good for quickly capturing ideas before you forgot them, but you'd still have to do some work with them the next time you opened OmniFocus. Whereas with the new feature utilizing iOS 11's directly connected Siri dictation, you can pop your task right into the specific OmniFocus project you want. Unfortunately, even though it directly ties into OmniFocus and Apple even showed OmniFocus on screen at the WWDC announcement, this Siri feature is not yet complete. Siri doesn't understand that OmniFocus has projects. Nor does it understand that there are also Contexts. Contexts in OmniFocus are places you need to be, things you need to have or people you're going to be with in order to do a particular task. So every task you have about money, for instance, could be given the context Accountant. Any To Do that you're going to do in Photoshop could be marked with the context Mac. It's all useful stuff but Siri treats OmniFocus as if it's like Apple's own good but basic Reminders app. Instead of projects and contexts, Apple Reminders just has lists. Consequently, you can't ask Siri to add something to your, for instance, Finances project, you have to ask it to add to your Finances list. More, you can't ask it to add a task to your Finances project with a context of Accountant. 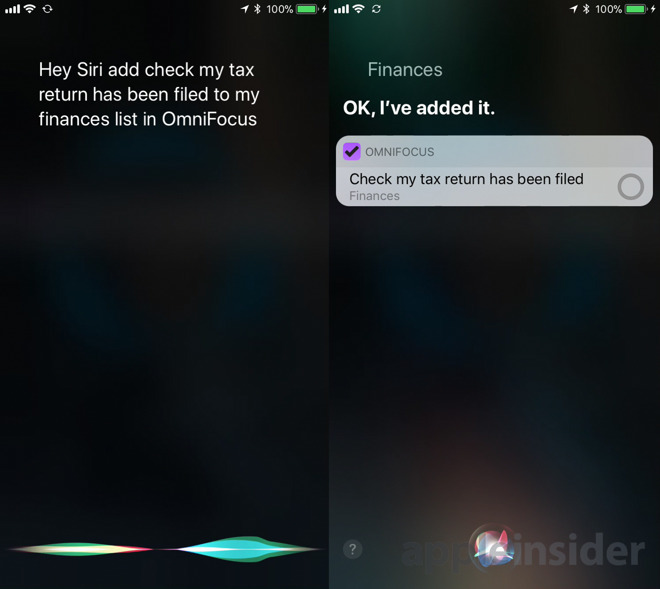 You can ask Siri to add it to either your "Finances" list or your "Accountant" list. There has always been a big advantage to using OmniFocus's existing Contexts feature because it's one way that the app chooses which tasks to show you and when. Say you've got dozens of projects and hundreds of tasks but you're at the airport and your flight's been delayed half an hour. Rather than go through every project looking for something to do, you can use OmniFocus's contexts to show you just, for instance, all Phone calls you've got to make. Maybe one call is to your accountant, maybe another is to your aunt, perhaps you need to book theatre tickets. It doesn't matter: because you bothered to say that each of these needed a phone, that each had a Context called Phone, OmniFocus can show you them all together. If you can't dictate both Context and Project, though, we found it better to stick to projects. It means we dump tasks into Finances, for instance, and then later have to go add Contexts manually. This doesn't sound wonderful given the constraints but it genuinely is. Once we'd done this dictating to a project once, we did it forever. We'd call across the office to the iPhone on our desk asking it to do this thing. When you know how to do it, using Siri to add directly into OmniFocus projects is far, far faster to do than to describe. Even though the second thing is that sometimes this dictation can feel a bit tortuously longwinded. "Hey, Siri, add Check my tax return has been filed to my Finances list in OmniFocus" does not come naturally. You need to think about it before you speak. 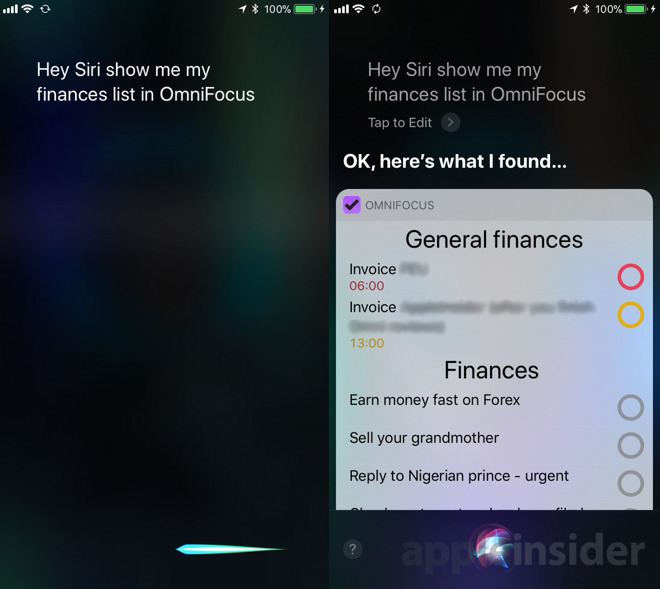 You can now also ask Siri to show you tasks from OmniFocus. "Hey, Siri, show me my Finances list in OmniFocus," for instance, will work. During our testing, though, the results were inconsistent: sometimes you would see just one item regardless of how many there really were. Other times you would get a more useful, longer list. Given that you are speaking and given that this is Siri, there are also going to be times when either you're not clear or you're just not understood. When that happens, Siri tells you that it's got options for where it puts your task in OmniFocus and it displays a list of all the projects and contexts. It can be a very long list but you can tap on the right one. One more thing about this dictation. You read that finances example and you understand it but what you can't know is that our Finances project happens to be buried deep inside other ones. Our OmniFocus setup has folders for work or home, clients or friends, and then some subdivisions of all that. The finances project is way down that structure of folders and projects but we don't have to remember that when you're dictating. 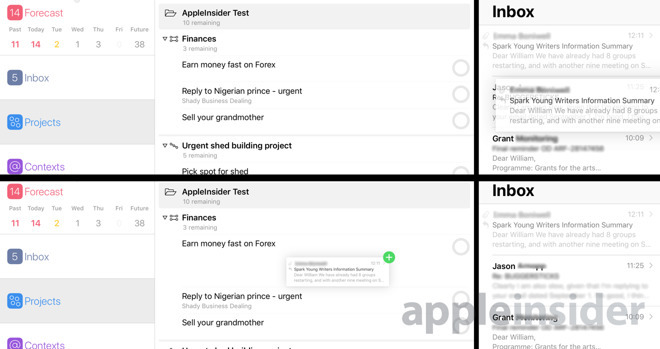 We don't have to say "Hey, Siri, add to my Work/Clients/AppleInsider/Finances list in OmniFocus", it just goes to the right place when we say Finances. Where you may need to keep that structure in mind, however, is in dragging and dropping. It sounds silly to feel gleeful at a new software feature but as much as we've come to use Siri dictation, it's the dragging and dropping that delights us. Dragging and dropping is now part of iOS 11 so anywhere you are, anything you press and hold on is likely to be draggable. If it's something that OmniFocus can understand, like text or a website URL, then you can drag and drop it into the To Do app. Maybe the single most common cause of To Do tasks, at least for us and we so strongly suspect you too, is email. OmniFocus already has many ways of getting tasks out of your email and into its database but now it's got drag and drop on iOS. 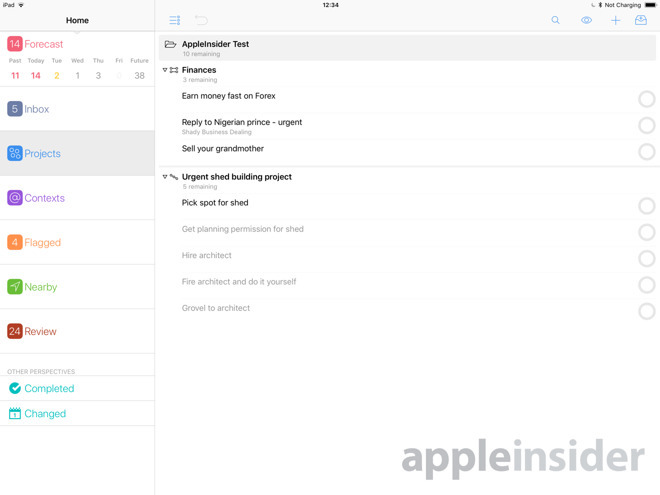 Have OmniFocus and Mail open in Split View or Slide Over on your iPad Pro. Select some text and then press and hold. 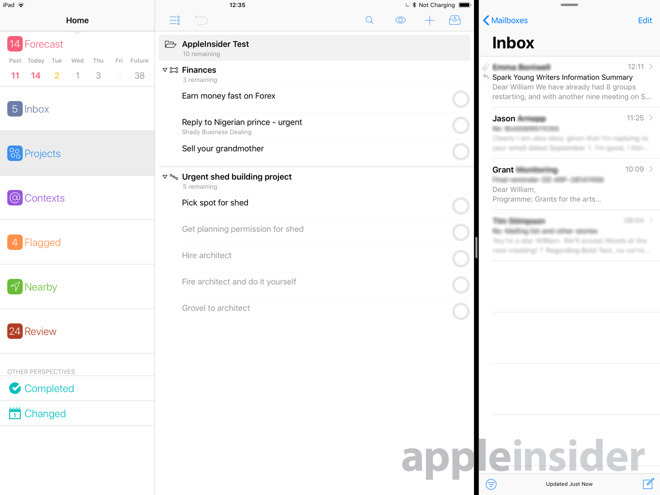 Or do the same in Mail's inbox view: press and hold on a whole email there. Then just drag it over to OmniFocus and drop. Seriously, it is gorgeous and we haven't become blas about it even after weeks of testing. It is fast and smooth and satisfying and we just can't do it enough. That doesn't mean it's perfect, though. It's close, but we did find one thing. When you drag an email over to OmniFocus, it becomes a single task and that's fine. However, Apple Mail threads emails so that a chain of messages is shown in your email inbox as just one, just the latest. When you drag that over to OmniFocus, the rest come with it. So you're dragging what you think is a single email and instead you drop two or more tasks into OmniFocus. Since they're automatically titled with the subject heading of the email, each task has exactly the same name. You need to delete all but one of these - and be careful to leave the right one. For each differs only in a link they have which takes you back to the specific email in question. You do want to be able to read that, you don't want to end up reading an email somewhere else in the thread. It's fair to say that OmniFocus works hard to make you use it as little as possible. The whole app is about helping you go do things instead of spending your life fiddling with a To Do list. Nonetheless, you do spend some time fiddling and now drag and drop will speed that up. Drag and drop inside OmniFocus works the same way as it does outside: press and hold on a task and you can then drag it to somewhere else. Inside your Finances project, for instance, you could drag the latest task from the bottom of the list to the top. That sounds like just a visual thing, just a way of reminding yourself that one task is more important than some others. It is exactly that. However, one of OmniFocus's longstanding features is the option for what are called sequential projects —ones that have tasks which must be done in a certain sequence.. You can't build an extension to your house without first getting planning permission, for instance. OmniFocus also lets you hide tasks to stop yourself getting overwhelmed so it might show you solely that planning permission To Do. Then when you've marked that as done, it removes that and shows you just the next thing. When you drag and drop within a sequential project, you do first have to tell OmniFocus to show you everything. When it does, you can then drag things up and down the project list and you are directly changing what order OmniFocus will show them to you in future. In these sequential or any other type of project, though, you're sometimes going to be dragging a task from one project to another. You're probably going to often drag tasks to different dates. You've always had pretty fast ways of making these kind of changes right from the keyboard but from now on you'll hardly bother with those, you'll just drag and drop. It is that handy. Except it's only handy when you've been shown how to do it. The dragging up and down a list feels natural but this moving between projects or dates does not. Date changing is the quickest example to show you. One of OmniFocus's best-loved features has long been its Forecast view which on the iPad and iPhone is a single row of dates. It's today and the next week plus a general Future one for anything after that plus a Past Due for anything you're lagging behind on. Forecast's chief use is to very quickly show you when you're busy and when you're not. It doesn't show you any of the tasks, it just has the number of tasks for a day. So if Monday has 30 items in it and Tuesday has 1, you know when you can relax. You know when you can take on more work and when you really can't. So say it's mid-morning on Monday and something new comes up. Something big. You can't get all 30 existing tasks done now and consequently you must move some of them. It would be great to be able to drag a task from today's list over to Forecast and drop it on the date for tomorrow. You can't. Not quite. What you can do, though, is this. Press and hold on that task then with another finger, tap on tomorrow's date in Forecast. The list in front of you changes from today's to tomorrow's. Drag your held task up until the top until tomorrow's date heading highlights and then drop. You're done. That task is now in tomorrow's list and all it took was a bit of iOS 11 finger contortion. We specifically said iOS 11 there instead of OmniFocus: this is the To Do app pushing at the edge of what Apple's operating system can do. On the Mac, for instance, you can click-and-drag tasks from today to a date on the Forecast list, you don't have to hold and switch dates. On the Mac you can also have multiple windows open and drag tasks directly between different projects. On the iPad and iPhone under iOS 11 you can at last do that same dragging - but sometimes it's even more contorted than with dates. The procedure is exactly the same: you press and hold on a task, then with another finger switch to the different list and drop when you reach the project you want. When you only have a shallow list of projects and folders it's fine but if you have multiple folders or you just have so many projects that remembering where each one is proves difficult, there are faster ways to move tasks around. Even so, we keep dragging and dropping. That's partly because it's new, no doubt, but it also contributes to how OmniFocus makes you feel as if you are immersed in your tasks. Especially on the 12.9in iPad Pro where you might have both hands on the screen -and now may need both hands to do all this holding and tapping - then it's like kneading your work. You can tell we like that and you've gathered that we think these new features in OmniFocus for iOS are little short of delicious. We really want more, though. Most of all, we'd like a way to drag and drop multiple tasks at once. To be able to drag six financial tasks out of our Inbox and into Finances in one go instead of half a dozen separate drags and drops. Again, you can do this on the Mac so it's not an OmniFocus issue, it's iOS. What's perhaps more of an OmniFocus issue is to do with this business of dragging items up and down your project list. Most of the time, we aren't looking at a specific project, we're looking at everything we've got to do today and that reordering doesn't work there. If you're an existing OmniFocus user then you're familiar with how if you specify that tasks have to be done on a certain date and you don't say anything else, the app puts them onto that day in the order you added them —and with some default time. Unless you choose a time the new task is due, OmniFocus will give it a time of 13:00 or whatever's specified in Preferences. It's done to help you get notifications when something is due. It's also something you can blithely ignore. If your job today is to get 30 financial things done then so long as you do that, you may not care much whether they were all done by 13:00 or not. Some people religiously put times against every task, I will do this at 10:00, that at 10:05 and an early grave by 11:00, and others might vaguely twiddle. Say these five tasks are the most urgent today so mark them as 9am and they'll go to the top of the list above all those others that are marked 13:00. Omni gave us drag and drop, and like the ungrateful users we are, we want more. Take it as a measure of how useful these new features are. What would be great would be to able to drag a task from the bottom of today's list up to wherever you liked. Right now we have no clue how OmniFocus would do that: would it alter the default time depending on where you drop the task in your list? The least it could do, though, is let you drag to alter things that have the same time. Since we only bother specifying a time when that is genuinely the moment we have to do something - we've arranged to call the bank at 11:00 for instance - then we usually end up with a long list of tasks that are all marked 13:00. You still can't drag those around and it would be handy to be able to do so. Still. dragging and dropping is so much faster than previous ways of organizing or capturing tasks that we could spend far less time in OmniFocus. Yet they're so good that we spend more time in it because we like the dragging and it's so useful. OmniFocus 2.21 for iOS has a free trial version on the App Store and then costs $39.99 for the Standard version. A Pro version is a further $19.99 upgrade or you can go straight from the trial to Pro for $59.99.